My colleague at Born Free Foundation in England, Chris Draper, recently visited SeaWorld Orlando and sent me the following report. It's too important; I had to share. I am proud to say that there are currently no captive cetaceans in the UK, and proud that the Born Free Foundation was involved in rescuing and releasing some of the UK's last captive dolphins in 1991. However, I wouldn't have to travel far from my base in southern England to find whales, dolphins, and porpoises in captivity; France, Italy, Spain, Netherlands, Belgium, and many other European countries have captive cetaceans. In fact, there are 33 dolphinaria within the European Union alone. So, while attending a conference in Florida, and in receipt of a complementary ticket, I forced myself along to SeaWorld Orlando. It should come as no surprise that I was not impressed. What was surprising is just how dire, how pointless, how vacuous I found most of SeaWorld to be. In some captive animal facilities, one can occasionally see a sliver of light-some miniscule redeeming feature or attempt to offer something positive for the animals (vastly outweighed by the overbearing and pervasive effects of captivity on animals, of course, but something). I saw no such silver lining at SeaWorld. On arrival, I made my way to the "One Ocean" show at the Shamu Stadium. The atmosphere was more like a baseball game, with sellers hawking popcorn and beverages, than a chance to witness majestic marine mammals. An introductory video attempted to reassure the audience how much "SeaWorld Cares." This was quickly followed by another video, featuring TV zookeeper/animal-wrangler Jack Hanna and Bindi Irwin (daughter of the late Steve Irwin), offering vague and fatuous platitudes about conservation, while imploring visitors with to donate "just" $5 to save the oceans. The mechanism by which your donation can assist marine conservation was unclear, and one can't help but wonder what the $55 weekday entrance fee to SeaWorld is spent on. After the videos: power-pop music, pumped at extremely loud volume around the stadium. I found this irritating-and one can only imagine how this affects the orcas, enduring this barrage of sound at least twice each day. And on with the show. The trainers appeared to be little more than dancers or cheerleaders, swaying with the music, clapping and gesticulating wildly at the audience. The trainers no longer enter the water with the orca: a consequence in part of the investigation following the death in February 2010 of trainer Dawn Brancheau at this very facility. Indeed, the orca who took Ms. Brancheau's life, Tilikum, was featured as part of the show I witnessed. Tilikum should be a majestic male in the prime of his life-but he's reduced to a jester in a show, his collapsed dorsal fin a testament to his lifetime in captivity. 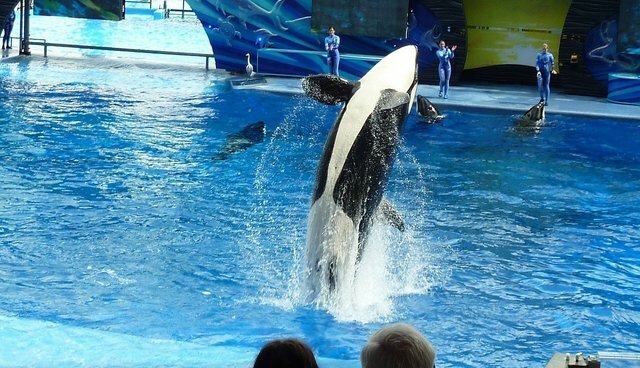 Overall, the "One Ocean" show consisted mostly of a limited series of choreographed jumps and beachings by the orca, supplemented by tail fluke- and dorsal flipper-waving. While, in my opinion, no amount of "education" could ever justify keeping these animals in captivity, I expected at least some sort of nod to educational messaging. But, no. The show was pure showbiz and schmaltz, tricks and razzmatazz: nothing about how far these animals would naturally travel, about how they are extremely social, about just how complex their natural behaviour is in the wild. I have visited far, far too many captive animal facilities and exhibits in my life, and I can honestly say that I found the "One Ocean" orca show to be among the least informative, most unnatural, and most exploitative exhibitions of animals that I have encountered. In my opinion, it is without a shadow of merit. I left the stadium confused and angry at how these magnificent mammals could be reduced to the status of clowns. But, it does not stop there. SeaWorld does not only exploit orcas. It has dolphin shows; "Dolphin Cove," where visitors can touch dolphins; and even a shallow and featureless dolphin "nursery" pool, in which females and their offspring may spend up to a year or more swimming in endless loops. And, among the rollercoasters, concession stands, and merchandise stores, there were other captive animals, such as flamingos, parrots, manatees, and turtles. As I wandered around, I saw so much to entertain humans during their brief visit, but so little to entertain the animals compelled to spend 24/7 on site. The sight of a walrus swimming an endless loop under water in what appeared to be an abnormal, stereotypic pattern of behaviour was the final insult-and I made my way dejectedly to the exit. SeaWorld and other marine parks are facing a tough time right now in light of increased public scrutiny on the ethics of keeping cetaceans in captivity. But, if we want this to be the end of the road, rather than a temporary bump, we cannot rely on falling attendance alone. We need to educate everyone about the realities of life in captivity for these animals, expose the half-truths and exaggerations in the parks' publicity, and change the way people perceive these facilities. And, Born Free is working hard around the world to do just that. Only last year, alongside our campaign partners, we were successful in ensuring that no dolphinaria will be built in India. We recently rescued the dolphins Misha and Tom from an appalling facility in Turkey and returned them to life in their natural home: the ocean. And, we are working for a Dolphinaria-Free Europe as part of a coalition of likeminded NGOs. Let's stop the shows, empty the tanks, and work for a future in which the only thing that makes us feel sick at theme parks is riding the rollercoasters and eating too much candy, rather than the sight of captive animals suffering.